The Bazigar of India get their name from rope dancing and acrobatics. They are acrobats. They have a low literacy level so the gospel message will need to be given in oral form too. The Bazigar in Uttar Pradesh speak Hindi and are not vegetarians. Marrying again is allowed. They are mostly monogamous. Adult marriages by discussion is their way. On the death of the father, the sons get the same inheritance with the oldest son becoming in charge of the home. The dead are cremated except for very young children who are buried. 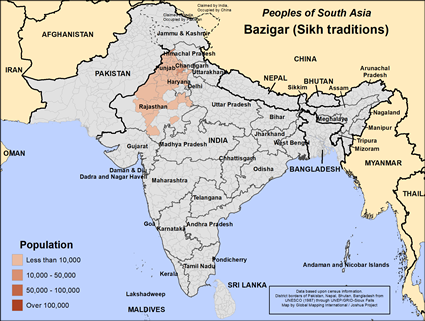 In the Punjab, the Bazigar are Sikhs. They speak in Punjabi and read and write in Gurmukhi. In Jammu and Kashmir, the Bazigar speak Gujarati and Dogri and read and write in Perso-Arabic. They eat wheat, maize and rice. In Chandigarh they speak Bazigar Boh and Punjabi. In Haryana, many do government work. The women here are vegetarians. In Himachal Pradesh many work as laborers. In Delhi, the Bazigar speak Hindi and read and write in Devanagari. 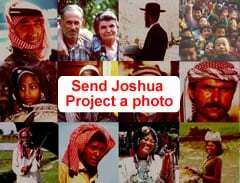 * Pray that gospel recordings will bring the Bazigar to Jesus Christ. Singh, K. S., ed. "India's Communities A-Z", Oxford University Press, USA 1999View Bazigar (Sikh traditions) in all countries.